Desired State Configuration (DSC) is a powerful configuration management platform that makes it easier than ever to perform cross-platform configuration management of your infrastructure, whether on-premise or in the cloud. DSC provides the management platform and Application Programming Interface (API) that can be used with any programming language. Windows PowerShell Desired State Configuration Revealed will take you through this new technology from start to finish and demonstrates the DSC interfaces through Windows PowerShell. DSC allows you to manage target devices by simply declaring what state you want them to be in, using new declarative language extensions, rather than writing detailed instructions to get them into that state. This makes continuous delivery in Windows easier than ever before. In an environment where changes and deployments are happening all the time, DSC makes the necessary adjustments to the system so you don’t have to. Windows PowerShell Desired State Configuration Revealed starts with an overview of the configuration management features in Windows, followed by a discussion of the architecture of DSC and its components. You’ll then explore DSC’s built-in features and resources, followed by some of the different methods provided for delivering configuration information within your ecosystem, and learn about configuration monitoring and reporting. In the latter part of the book, you’ll find out how to get more power out of DSC by writing your own custom DSC resources, including a range of useful examples, and the book concludes with vital information on deploying and troubleshooting DSC in a production environment, along with some expert tips and tricks you might find useful along the way. 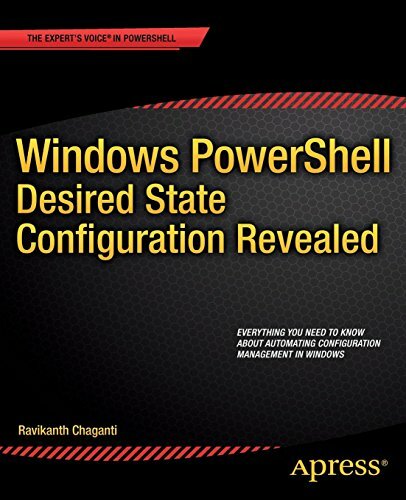 Windows PowerShell Desired State Configuration Revealed is your one-stop guide to this new technology and how it can change your working life for the better. Windows PowerShell Desired State Configuration Revealed is for IT administrators, developers and DevOps engineers working in Windows-based data center environments. With a little prior PowerShell scripting experience, this book can be used as an in-depth reference to creating, customizing and extending DSC in Windows. IT administrators with limited scripting experience will also find this book a useful overview of what DSC offers and how to use DSC resources to automate configuration management and deployment. DSC is available as part of Windows 8.1 and Windows Server 2012 R2. You can also get DSC on Windows 7, Windows Server 2008 R2 or Windows Server 2012 by installing Windows Management Framework 4.0.